Is this an over 18’s event? Yes it is an +18 event and you will need valid I.D. to enter. Please see our Entry T&C’s for more info. Where is Electric Gardens Festival held? SYDNEY – Brazilian Fields, Centennial Park, Sydney. You can read more about Centennial Park here. How do I get to & from Electric Gardens? I haven’t used Eventbrite/Moshtix before, do I need to create an account? No, you don’t need to do this before buying your tickets online. If you’re a new customer to Eventbrite all you need to do is enter your details in the checkout process and an email confirming your order will be sent within 2 minutes of placing the order. Yes, you do need to do this before buying your tickets online. If you’re a new customer to Moshtix you need to enter your details and sign up before purchasing your ticket, this takes less than 2 minutes. Why do I need to provide the name and email address of everyone I’m buying tickets for? We will be checking ID matches the attendee name on each ticket. This reduces ticket scalping by preventing anyone buying tickets who isn’t coming to the festival. We also ask for your mobile number in case of emergency on the day. This year we will not be emailing tickets until 2 weeks before the festival. Please make sure you enter yours and your friends (if buying in the same transaction) email addresses carefully and avoid errors. Eventbrite will send a reminder next year to alert everyone that tickets will be issued soon. I need to change the name on a ticket, how do I do this? This year, name changes are not required. To avoid ticket scalping, please only purchase tickets through official ticket partners. No. You can either print out the PDF ticket and bring it with you, or show the ticket on your smartphone for scanning. Download your tickets in advance, before you get to the entry gates, to avoid any issues with the mobile network being too busy on event day. The easiest way to keep your ticket safe is through the Eventbrite app. Simply login with the same email address and the tickets will be available in the app. Log in to your Moshtix account used for the purchase and select Show My Ticket for the relevant event. You then have the option to view the ticket in your browser, download or resend them to an email. If you prefer not to print your ticket you can display them on your smart phone for scanning. Terms of sale state that there are no refunds available however you can pass your ticket onto a friend to use. No problem! The easiest way to get your tickets is to find your email order confirmation: tickets will be attached as a PDF file you can print. For online or phone bookings your confirmation is sent via email within 24 hours after booking your tickets. Your tickets are attached to this confirmation email as a PDF file. You have the option to print the tickets off or display them on your smart phone for scanning. Or log in to your moshtix account used for the purchase and select Show My Ticket for the relevant event. How much is General Admission Ticket? You’ll find all ticket prices on the relevant Event page. How many tickets can I purchase in one transaction? Six tickets is the maximum you can purchase. Where do I find the line up? The line-up for each event will be announced separately. Read all about the artists that have been announced so far here. The week of the event. When will site maps be released? No. Once you leave the venue you can not regain entry. No, but suitable footwear is required. Wearing gang colours, patches or insignia, or any clothing with offensive material is not permitted. Weather can be unpredictable. 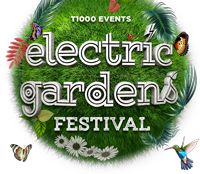 Please keep an eye on the weather forecast for Electric Gardens and if rain is likely please bring suitable wet weather clothing, or brave the elements as you wish. Umbrellas are not permitted for safety reasons. We do have enclosed tent areas on site but these can only accommodate a percentage of the crowd at any one time. If a VERY hot event day is forecast, please prepare accordingly. We will do our best to make the day as comfortable as possible but there is only so much one can do so make sure to wear a hat, apply sunscreen and dress appropriately for the conditions on the day. Slip, slop, slap. Where can I find the Conditions of Entry Policy? Click here to see the Terms & Conditions of Entry Policy.